Be the first to share your favorite memory, photo or story of Tyson. This memorial page is dedicated for family, friends and future generations to celebrate the life of their loved one. 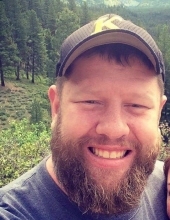 Tyson Cleo Johnson, 39, Kuna, Idaho was called home on April 1, 2019. Tyson was born on June 14, 1979 in Pocatello, Idaho to Perry Jay and Joy L Johnson, the youngest “and biggest” of six children. Tyson was involved in many physical activities during his youth. He participated in baseball, basketball, track and football. He was known and as “The big guy” on the court and field. He graduated from Salmon High School in Salmon, Idaho with the graduating class of 1997. Tyson graduated from the Idaho State University Law Enforcement Academy. He earned a sharp shooter award and was also awarded a trophy for the top shooter in his class. In 2001, while working in Pocatello, Tyson found the love of his life, Contessa Lynn Castillo. They were married for time and all eternity in the Bountiful, Utah LDS temple on August 3, 2001. He became a daddy on November 9, 2002 when Carter Perry was born. Being a daddy was a very natural transition for Tyson so when Derrick Alvin, Evelynn Contessa and Desmond Tyson joined the family, Tyson found his place in life. Tyson is survived by his loving wife Contessa; children, Carter, Derrick, Evelynn and Desmond; his parents, Perry and Joy Johnson; and his siblings, Janna (Blake) Phillips, Randall (Christie) Johnson, Ronda (Darryl) Hobbs, Bradly (Letitia) Johnson, and Jared (Alyssa) Johnson. Tyson is also survived by many nieces and nephews, with whom he had a special relationship and loved very much. Funeral services will be held at 10:00 am, Saturday, April 6, 2019 at The Church of Jesus Christ of Latter-day Saints in Kuna, Idaho, 3305 W Kuna Rd. The family will visit with friends Saturday morning from 9:00 - 9:45 am prior to the services. Burial will be in the Kuna Cemetery. "Email Address" would like to share the life celebration of Tyson C. Johnson. Click on the "link" to go to share a favorite memory or leave a condolence message for the family.